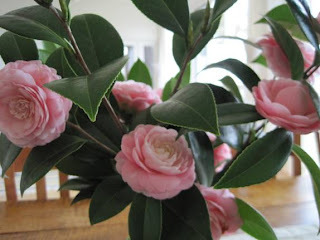 You cannot visit the South at this time of the year and avoid falling in love with camellias. I am crazy about them. I spend an embarrassing amount of wintertime on line at the American Camellia Society website, where you can tune into what can only be called a beauty pageant of these glorious things. 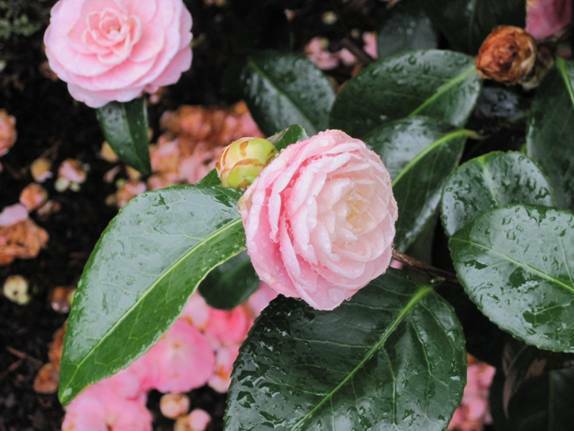 I fell in love with camellias in New Orleans, where my then-husband’s family lives. Thos. Lemann took me to see Longue Vue, a stunning house and garden designed in the late thirties by Ellen Biddle Shipman and William and Geoffrey Platt for the Stern family. I was a goner at the sight of those canopied branches bowing under the weight of peau de soie petals, each arrayed with what seemed like mathematical precision. An individual camellia blossom, say, in a vase, or floating in a bowl, is the epitome of graceful, insouciant chic. But if you come upon them gathered together, you are in the presence of a lusty, nay, orgiastic riot of attention-seekers. The white ones seem most demure. The best kinds of camellias are the ones you stumble upon accidentally. They always leave me dumbstruck. In Virginia, camellias are so abundant that people even sheer them into hedges. In spite of being treated in so disrespectful a fashion, they manage to pull off the regal bearing that is their true nature. 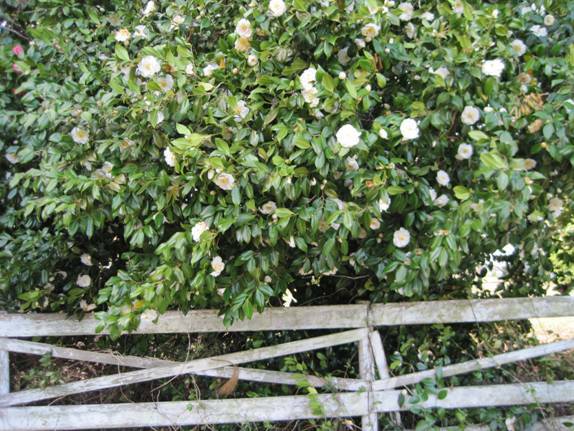 We went to poke around a rather dilapidated house (yes, we were trespassing, I can never resist a sagging porch) and we were overcome by the sight of camellias at least twenty feet tall, bursting from behind fences. This gives new meaning to dishevelment. Or just sitting in lonely splendor like a brooch twinkling against what must have once been a well-groomed lawn. 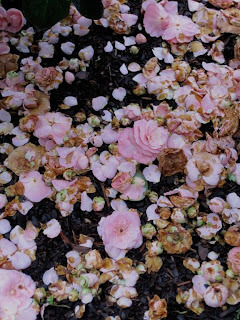 I especially love the sight of what I think of as Trashed Camellias, the carpet of spent blossoms that pile up and rot away at the tree’s feet. There is something marvelous about such lavish decay. Camellias are a bit histrionic, it is true. All that Pink Trash makes you understand something about living hard and dying fast. We left Texas (and those monthly visits to New Orleans) with 18-month old Alex, and moved into a house in Pelham, New York. I was astonished to discover in the backyard a ten-foot tall Japonica, looking only a bit the worse for wear. I never would have known what it was if it hadn’t been for all those visits to Longue Vue. Denuded camellias are a shadow of their former party girl selves. This one began blooming in April, and kept going for a month. I pulled the ivy off it, pruned it a bit, fed it, and cherished it. I hope the new owner understands what a treasure she has. Camellias hate to be ignored. Well, actually, they don’t even register that. They always behave as if they were confident that they are the center of attention, even if no one is looking. That’s quite something, if you can pull it off. Though these look a bit frowsy-headed, I admit. I don't know why, I have always muddled gardenias and camillias. They do look a little alike. Whenever I think of Camille, I see her with a gardenia and not a camillia... thoroughly maddening mixup. I doubt after this wonderful post I will make that mistake again. They are spectacular. Thanks to the link for Mr Orr and Happy Easter! One of my favorite flowers! My husband is from Louisiana and we are going in a few weeks and I am looking forward to seeing them in bloom. Thanks for the link to Stephen Orr's blog. Oh....I like camellias, too...although I probably should emphasize that, since I grew up in the mountains (Upper East Tennessee), we regarded them as an unobtainable rarity. To be honest, though?...Pizza, McDonalds, and Merle Norman cosmetics were similarly prized. In my thirties (here in Durham, NC), I moved in with a woman (a Harvard graduate and Random House novelist) who'd suddenly inherited her grandmother's house. 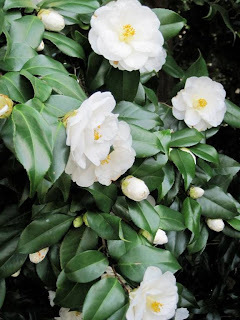 Having been to the house only at night, I was surprised to find, on my first actual day in the house, that there WERE, indeed, a lot of big windows.....they were just covered-over by a herd of enormous, 15' or taller camellia "bushes". 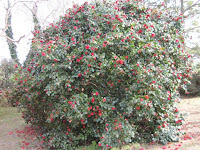 These were (are, I suppose) scarlet, old-fashioned, thick and leathery-blossomed camellias. Every year, and exactly synchronized with the flat-end of the "holiday season", they'd begin dropping great masses of pulpy, red, bruised blossoms. 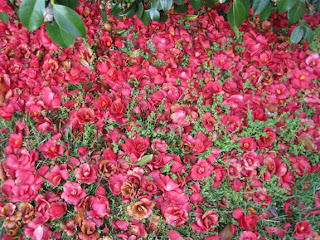 The entire perimeter of the house was, basically, surrounded by sodden piles of half-dead, soppy, scarlet camellia flowers. And, every year,my house mate would say "Someday, when my mother dies and I don't have to hear about cutting Grandma's HEIRLOOM camellias, I'm going to have every one of those damn bushes cut down to the ground. I'm sick of looking out the windows and feeling like I live in a meat processing plant." I never neccessarily agreed with her, but you have to admit it was a startling way of describing the situation. for the record?...I moved out (after seven years), bought the already-restored old house 2 doors up the strteet, and recently planted six white camellias. Thanks for the blog.....which I've forwarded to a large number of friends. Not entirely incidentally? I began subscribing to H&G when I was given a copy of "Around the House & in the Garden". H&G was one of the three magazines we subscribed to in this house, and I'll emphasize(note: I'm notoriously haphazard and unconcerned in regard to "home decor" and/or my clothes)that we did so only because of your monthly, introductory letters. I've given copies of "Around the House and In the Garden" to more friends and acquaintances than I can recall. You're obviously a very fine writer; more importantly?..it's obvious in all of your essays that you've completed the business of living something before you presume to write about it. "Around the House and In the Garden" is a really lovely (and, in my opinion, damned USEFUL/Genuinely-Helpful) book...and one of the few (Barbara Grizzuti Harrison's "Italian Days" comes to mind as another of the few examples)books which I think anyone could productively dip back into from time-to-time. So?...I buy another copy and give it as a present everytime I have a friend or meet someone going through a bad patch in his/her life (for better or worse, I'm not the sort to give folks-with-troubles a copy of Deepak Chopra or St. Augustine's Confessions). I'll look forward to reading your new book when it arrives, and thanks for your writing. I expect that it gives a great deal of pleasure and comfort (and plain amusment, since you are quite capable of being wryly amusing) to more people than you seem to realize. When I think of camellias I think not of the South (which I probably should, being a Virginian) but of England. In particular those lovely quiet residential squares in London, where camellias so often flourish and make such a grand statement against all that Georgian brick and black iron. I remember walking to an appointment at a house in Montpelier Square and stopping for a moment to examine the pearl-pink blossoms of a camellia in full lascivious bloom. Can a camellia be lascivious? I'm so happy you noticed them! I have never seen them as extravagantly healthy as they are this year. So many blooms. Such colour. Given that they often fall prey to a late freeze, this year is a wonderful treat for all of us here in the South. They remind me of Southern church ladies in flamboyant hats. Just in time for Easter. I'm also crazy for camellias - their season in the UK is just about coming to an end. I'm not sure that pots on roof terraces are ideal for growing camellias, so I've stuck to more tropical vegetation, which occasionally produces the most unusual flowers. And let's not forget the false camellia tree which also has gorgeous peeling bark and can live in zone 5: stewartia pseudocamellia! I came to love camellias by default. They were here when we bought the house. For our sixteen years here, they've been reliable and beautiful requiring almost no maintenance. Sometimes I imagine how great they might look if I actually paid any attention to them. Lovely camellias and indeed, a wonderful play list by Stephen. I once was lucky to have Tom Cooper and Roger Swain down the hall... but unfortunately, it was before I became a gardener!! Imagine that. Have a lovely spring weekend! This post about camellias came in my email and made me smile- my sweet Australian Shepherd is named Camelia (one 'l' easier for a doggy than 2!) and she is pink and white like the flowers. There is such a warm spring feeling to the flowers and your writing-thank you! And, since they herald spring, their bright histrionics at the front door are more than welcome. My dad and I planted a camellia in his backyard five years ago as my mother's memorial tree. It wasn't until this year that I got to witness it bloom—wow, what a sight. Such a lush flower and lush post. I could fall into it as though standing in the center of a big camillia bush, surrounded by the splendid blossoms. I live in Baton Rouge, La. in an older 1920s neighborhood where many young couples are coming in and pulling out 70+ year old Camellias to put in new landscaping. It breaks my heart. 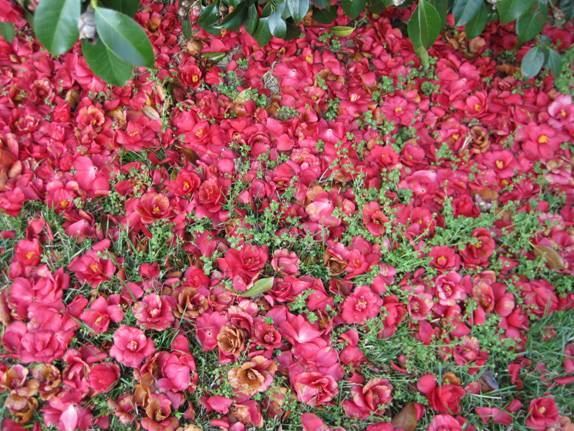 It's refreshing to see your appreciation for this old southern heirloom plant, especially the 'trashed camellias' (i too love the carpets they create). P.S. I just started reading Slow Love a couple days ago and I'm enjoying it so much.